Some family friends named the Kirchmans gave me a bleeding heart plant at Lily's celebration of life/memorial service over 5 years ago in March 2010. I remember when they first gave it to me thinking that the little pink hearts were a powerful reflection of my bleeding mother heart. My heart that bleeds both love and sorrow. And how perfect that hearts remind me of her and my Valentine's baby shower. We planted the bleeding heart in Lily's memorial garden and each spring around her birthday, it blooms. It is something I look forward to in the spring... the time of year when she came, but never came home. This is something I wrote on my blog last year about this plant: "Several days ago, I realized with a heavy heart that I had not yet seen the bleeding heart blooming this year in the spot where it was planted. I mentioned it to my mom and we both wondered if it would come back. Then yesterday, my mom told me excitedly that I had to come see something in Lily's garden... the bleeding heart is indeed coming back! It is just starting to bloom, but it sure made me smile to know it's still alive. It is a connection to March 2010. A connection to Lily. It feels like the Lord is gently whispering to me through this little plant that He has not forgotten. This bleeding heart is a reminder that though things may sleep through the winter, they come back in the spring! The spring is such a glorious time of hope and resurrection. The beautiful weather has lifted my spirits more than I can say. I am so thankful the Lord brought this little plant back to life. And even though it appeared it was gone forever, it was just sleeping. Lily might appear to be gone forever, but she is just asleep to this world... but forever alive in Jesus." 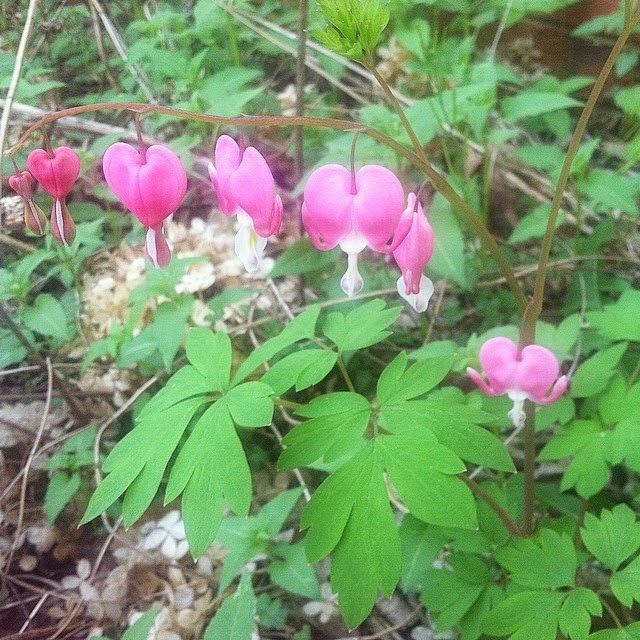 This photo is the bleeding heart blooming today, for the sixth spring season.